I can’t think of clever subject! Well it is good to hear that everybody is alive and well! Im not too bad myself! This week was a good one! Long, but good. So last week after we wrote and ate and all that good stuff, we didn’t have to go to Merida for District Meeting so we had time to go and climb to the top of one of the pyramids, the biggest one named Kinich Kak Moo. I took some photos that if I get a chance to send, I will! But what was really cool/weird, is that when we were at the top, we were literally at the highest point in sight. The pyramid is pretty big, but it isnt a mountain or anything. It is just funny because the Yucatan is superrr flat. I was pretty sure I could see across the Gulf into the states. Not really but you get the idea! So this week was pretty rainy which I didn’t like… One night we had just gotten into a house for an appointment when it started pouring like crazy. We were standing in the doorway watching and like all of the powerlines started shooting sparks and the power went out in the block. Goooooood times haha. Oh so on Tuesday we had a training meeting in Merida with 2 other zones that was really awesome. President and Hermana Garcia are super awesome and the meeting was really good, and really productive too. 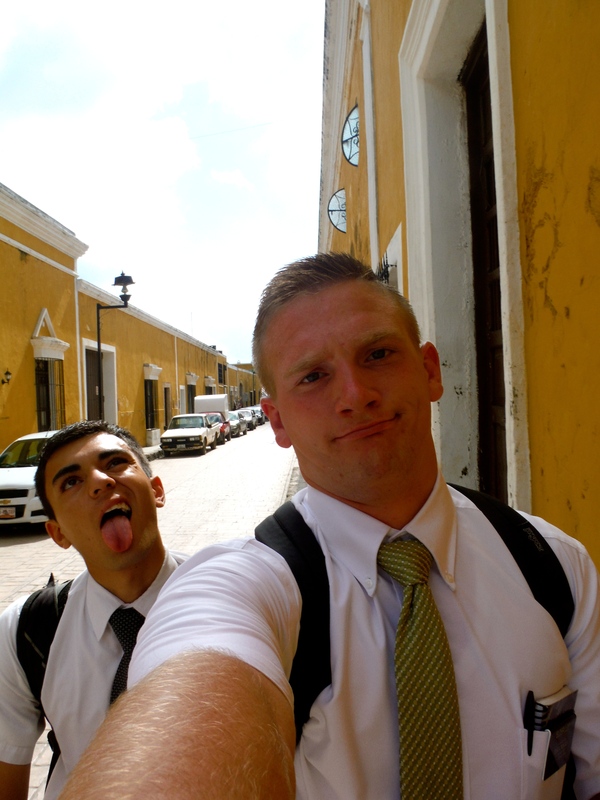 I feel like I learned a lot, but Elder Cornejo came out of it with a new mindset which was super awesome for him. It was pretty cool too because my Dad was there at the training! Elder Haydock (who I was only with for a little) and my brother (Elder Haydock is training again) were there so it was cool to see him and catch up. Also at the meeting there was a new group of missionaries! They had like 2 weeks in the field, so it was super cool to see people where I was just like 3 months ago! Jeeze Ive learned a lot in 3 months… The mission is awesome. haha. The biggest thing is the spanish, I havent really mentioned anything about it, but it is a lot better now haha. Im far from fluent but I am doing more than just surviving too! So yeah, this week was kinda uneventful, but I GET TO SKYPE YOU ALL SOON! WHOOOOOOOOO! I am super excited for that! On the 23rd we are having a mission wide party in Merida (so I will get to see everybody from Campeche which I am excited about), and the 24th we are going to eat at the Familia Ricaldes house (they are super awesome) and then Christmas I get to call! Im not really sure how its going to work, but if Mom and Dad could send me the information for your skype account so I have somebody to call, and I dont know if you want to make me an account too and send me the information? I don’t know what to do! Well I love you all so much! I am doing super well, and I hope you all are too! I miss you all a ton! I look forward to next monday to hear from you, and even more to Wednseday to see faces! AHHH! Have a good week everyone! 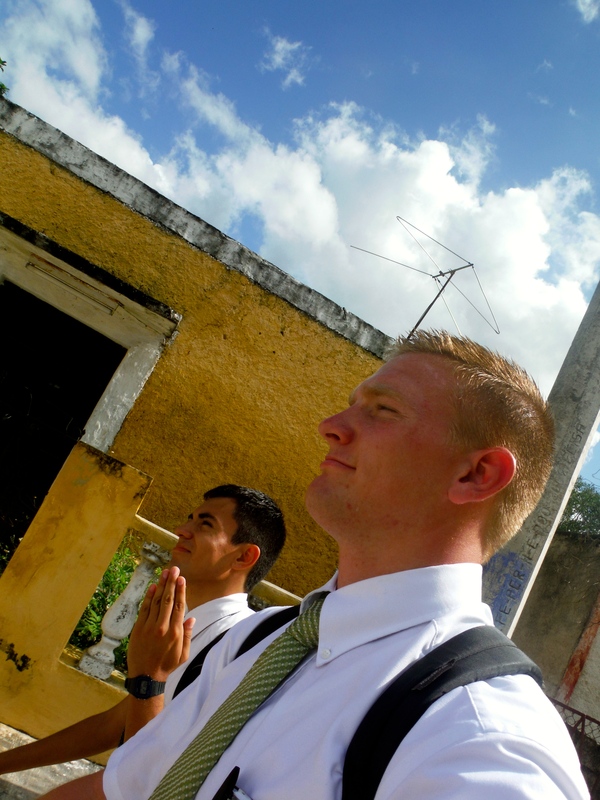 This entry was posted in Izamal, Pictures on December 18, 2013 by Courtney and Nickolai.